Turkish President Recep Tayyip Erdogan met with his on-then-off-then-on-again ally, Russia President Vladimir Putin, signaling the latest relationship of diplomatic and economic relations between Ankara and Moscow. The picture of two shaking hands finds the Tsar and the great Sultan in the same boat. They find themselves to be rational to de-escalate tensions. Erdogan’s trip to Russia marks his first foreign trip since an attempted military coup in Turkey on July 15. The coup failed and since then, Erdogan has led a crackdown on tens of thousands of alleged anti-government “plotters.” In turn, Europe has warned Turkey not to use the coup attempt as an excuse to restrict civil liberties and political opponents. It has been particularly perturbed at calls for the death penalty to be reinstated for those accused of treachery against Erdogan. Judging the meeting between Erdogan and Putin in St Petersburg on August 9, the meeting we have seen a build-up of reconciliatory gesture. The meeting marked the first time the leaders have met since their dramatic falling-out over a downed Russian fighter jet, which the Turks alleged had entered its airspace, last November which led to the deaths of the two Russian pilots. The incident blew apart the generally harmonious relations between Turkey and Russia with the latter imposing sanctions against Turkey and accusing it of helping the militant group Islamic State. There are several interests that work to push Russia and Turkey into alignment: considerable economic and business interests from trade and tourism to construction; the Turkish Stream gas pipeline across the Black Sea; and frustration with Western political judgment and accusations of authoritarianism in both states. As Ankara blames the self-exiled cleric Fethullah Gulen for both orchestrating the takeover attempt and sparking off the crisis with Russia, as a gesture of goodwill the pilots involved in the November 2015 shoot-down have now been detained by the Turkish authorities. Surely Russia is in a league of its own. It remains a top economic partner for Turkey. The economic argument has perhaps more sway in Ankara, regardless of the coup attempt. The EBRD last December, as Moscow and Ankara levied sanctions against each other, said that the then-proposed sanctions “may reduce Turkey’s GDP growth in 2016 by around 0.3 – 0.7 percentage points.” The closest connections were in the energy and tourism, with Russia the main supplier of natural gas to Turkey and Russians the country’s second-largest contingent of tourists, making up “12.2 per cent of the 37 million tourist arrivals to Turkey in 2014,” just behind Germans. The impacts of sanctions on Russia, the EBRD said, would be more limited. The Turkish Stream pipeline is important for both capitals: if completed it would help cement Turkey as a major energy conduit to Europe and promises to transport 63 billions of cubic meters of gas per year from Russia to western Turkey. The Moscow Times reports that the project, which has been frozen at an early state since the jet incident, were to be among the main topics in the Putin-Erdogan meeting. The third area of mutual interest noted above, that of frustration with Western judgement, has different meanings for each country. Russia, long used to critical comments from the West with regard to democracy, rule of law and human rights has perhaps been able to cultivate a new solidarity with the Turkish president. It appears that the current rift with the West pushes Turkey closer to Russia. The US is blamed for failing to cooperate with the Turkish authorities for the extradition of Gulen – the alleged mastermind of the coup attempt. Many in Turkey see the US as the chief culprit. The majority of Turks also berate the EU’s reluctance to stand by Erdogan as he faced a life-threatening situation, and criticize Europe’s exclusive focus on the clampdown that followed, ostensibly targeted against the “parallel state”. The historical record shows that any time relations with Western allies are strained, Ankara tilts to Moscow. This happened after the 2003 war in Iraq; between 1997 and 1999 when the EU refused to invite Turkey for membership talks; following the invasion of Cyprus in 1974, and so forth. The defrosting of relations and the St Petersburg get-together came at an opportune moment for the two leaders. Both Putin and Erdogan share a similar “strongman” stance towards leadership and both have overseen a revival in conservative, nationalist domestic politics. In addition, both have an awkward relationship with their mutual neighbor, Europe. Ankara was recalibrating its foreign policy even before the July 15 coup attempt. The reset with Israel was followed by tentative overtures to Egypt. Moreover, there has been speculation that Turkey is also seeking communication with the Damascus regime. 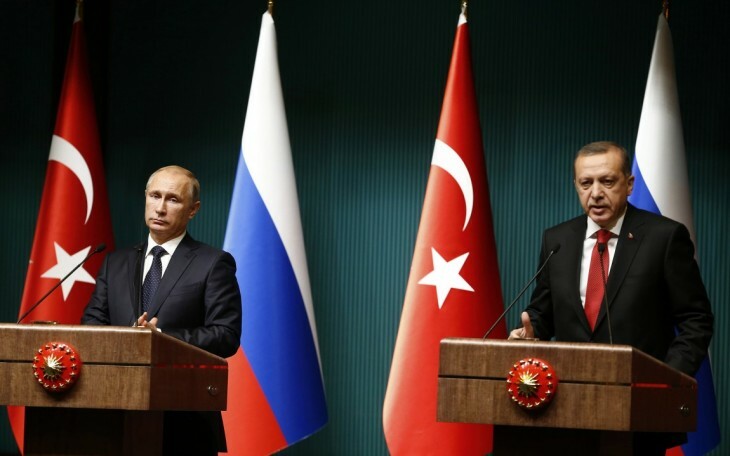 Russia and Iran’s expressed support for the Justice and Development Party (AKP) government in the aftermath of the coup attempt may improve chances for such (cautious) re-engagement with Syria, but one should not bank on a U-turn. The elephant in the room–where Russian and Turkish policies have diverged the most in recent years–is Syria. The complex web of actors is enough to tie one’s brain in knots: Russia supports Syrian president Bashar al-Assad, whereas Erdogan has long derided the embattled Syrian president; NATO (of which Turkey is a member) has focused the fight on ISIS while also supporting anti-Assad groups; meanwhile, Russia has been long-accused of specifically targeting anti-Assad militants and hitting, but not very hard, ISIS. But, the United States has also devoted resources to supporting Kurdish militias, much to Erdogan’s frustration. Russia has supported at least one Kurdish militia, but prioritizes Assad remaining in power over supporting the Kurds. If Turkey can budge on Assad, Russia may be willing to budge on supporting Kurdish groups. The focus on Erdogan diverted attention from Putin’s ongoing efforts to strike a deal on Syria with the US and its allies. US President Barack Obama was no longer the arch-villain that the pro-Kremlin media made him out to be at the peak of the Ukraine crisis in 2014. But Russia has always been wary of a bog-down scenario. Having announced a pull-out from Syria in March, Moscow has its air force locked in in a fierce campaign against rebels in Aleppo. Most recently Russian bombers flew out of Iranian air bases to attack rebel positions in Syria. Iran’s intensely nationalistic revolutionary regime had never permitted foreign forces to operate from its soil. By allowing foreign troops on its soil for the first time since the 1979 Islamic Revolution — and Russians for the first time since World War II — Iran may be seeking to show it can end its isolation with or without the United States. However, Turkey can’t abandon the Western alliance, because over the years it has developed an umbilical cord to Western capital and goods markets. 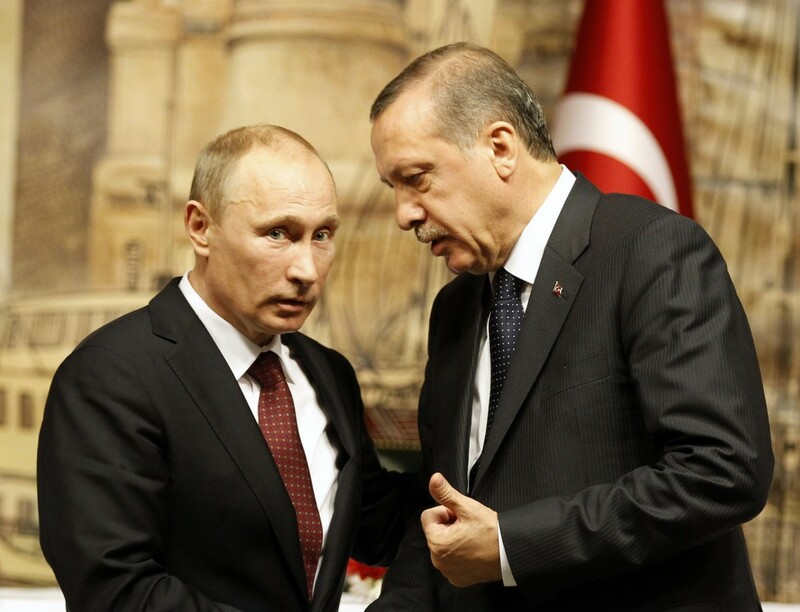 Turkey has insisted that its friendship with Russia does not mean it is turning its back on the West or its place in NATO, the military alliance initially set up to counter Russian power. This has led one analyst to believe that Turkey is strategically treading a fine line between the west and Russia.